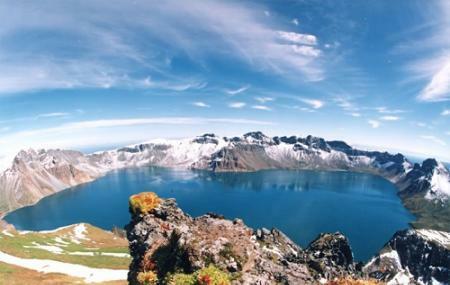 Rightly monikered as the Heaven Lake, a visit to the Changbaishan Tianchi is no short of a trip to paradise. Located near the village of Fusong Xian, this lake is considered to be one of the top attractions of China. Once you reach the Tianci Tourism Holiday Village, you will be brought to the lake by a 4X4 vehicle, which is a ride in its own! You will get to plenty of volcanic formations and attributes related to it, through this lake. Use Baishan trip planner to visit Changbaishan Tianchi and many others to your visit. You won't miss your home when in Baishan, hotels in Baishan like Xiyangyang Fashion Guest House, Dongxiangshun Inn and Lan Hotel And Spa Changbaishan offer some of the best places to stay in the city. Choose from variety of exclusive Baishan vacation packages for your next visit or create own own. Check out the various options for how to reach Baishan and finish off your vacation package by booking the ideal transfer. Love this? Explore the entire list of places to visit in Baishan before you plan your trip. Fancy a good night's sleep after a tiring day? Check out where to stay in Baishan and book an accommodation of your choice. Amazing one, I think I need to put in my bucket list to go hike and see, someday. It was only before I did my homework that I found out I had to spend two days to appreciate the full beauty of the Heaven Lake - one day reaching the top of Changbaishan from its north side and another day from its west side. The advantage of going up the north side is that it’s quicker and less demanding on your legs as you just hop on a 4X4 which takes you from the bottom of the hill all the way to the top. The disadvantage is that you get a narrower longitudinal view of the Heaven Lake, although it is still a spectacular one. The advantage of going up the west side is obvious - a more stunning panoramic view of the lake as you stand in the middle with the extremes of the Lake on your right and on your left. In order to get to this vantage point, you must be prepared to walk up over 2,000 steps from the parking lot at the bottom to the crater’s edge at the very top (the Heaven Lake is a crater lake). Yet, don’t be scared like I was before I scaled these 2,000 steps. They turned out to be very low steps which you should be able to hike in 45 minutes. Should your legs give up on you at any point up or down the mountain, there are sedan chairs, lifted by 2 strong local fellows, which you can hire. The Heaven Lake won’t disappoint anyone. Its sheer size, its shades of blue and green water, its jagged rocky rim, and the ever changing clouds that hover above together leave you an imprint that will linger in your memory for years.